KittyKat Glass Designs: Fall Festival Fever is Here! Fall Festival Fever is Here! I have spent all week getting ready for my next show - Labor Day weekend - at the Tides Inn Resort in Irvington, VA. I did this show over Memorial Day and really liked the setup. It is a small event - about a dozen local artists - but all are top quality. Come by Sat or Sun from 10-5 and say hello. On Sept 7-8 (from 9-5), I will be at The Bay School in Mathews, VA during Mathews Market Days. For this event, I am doing something different: I will be making CUSTOM LEATHER BRACELETS! You pick out the color or leather and the slides or charms you want, and I'll make it right there just to fit you. In October, I will be in Williamsburg, VA the 6-7 for An Occasion for the Arts. I will be in booth A48 on Duke of Gloucester Street (the main cobblestone street through the colonial historic area). This is a premier arts event in Virginia and features fine artists from across the nation, a wide variety of entertainment, live demonstrations, wine tasting and other fun and exciting activities for the whole family. On October 13-14, come see us at the Port Warwick Arts and Sculpture Festival in Newport News. If you haven't been to Port Warwick, it is a real treat. The planned community is in Oyster Point. The show is at Styron Square and starts at 10:00 am and runs until 6 on Saturday and 5 on Sunday. 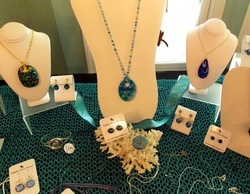 Enjoy world-class art, gourmet food, and fine wines and of course, KittyKat Glass Designs jewelry! I have applications in for a number of spring events, so keep checking back. Absolutely. This is the real deal. My husband and I live in Mathews,VA (USA) "The Land That Time Forgot" as he calls it. Our county is so rural that we don't have a single stoplight, and we like it that way! The quaint fishing town at the mouth of the Chesapeake Bay is a mecca for retirees from Richmond and DC, and has a great community of artists. My mom was a painter and a founding member of the local artist cooperative. I did not inherit her artistic ability with a brush, but I am a lifelong pianist and organist, and now I have my own jewelry business, KittyKat Glass Designs.